The 2019 Fiat 124 Spider is similar to the Mazda Miata but just different enough. The pint-sized cruiser makes for a fun weekend car, especially in its Abarth clothing. Car enthusiasts and Fiat fans should enjoy picking between all the different available packages. 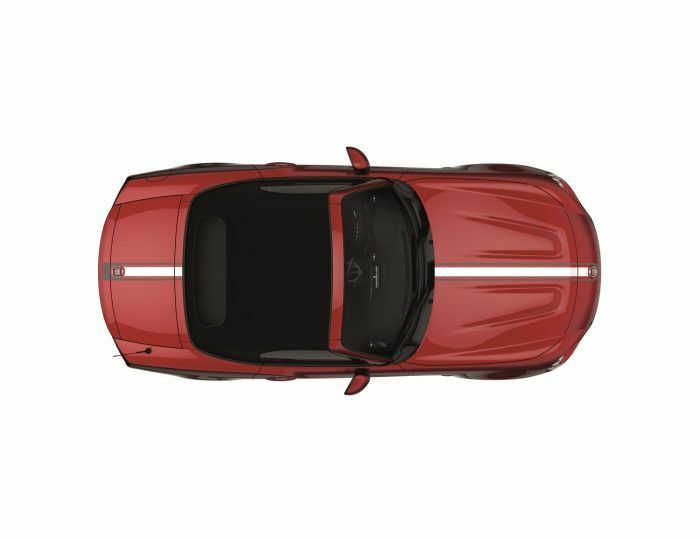 You know the Fiat 124 Spider, right? It’s the current Miata in an Armani suit, but not really. It’s actually more than that. There are pretty significant mechanical differences on top of the Italian styling. And now, improving on that already great beginning, Fiat has done some nice updates. The biggest difference between the Fiat and the Mazda is the engine, of all places. With the 124, gone is the snappy two-liter Japanese plant, and in goes their rather clever Multi-Air four-banger. They say it doesn’t make more power than the Mazda equivalent, but it revs higher and quicker. 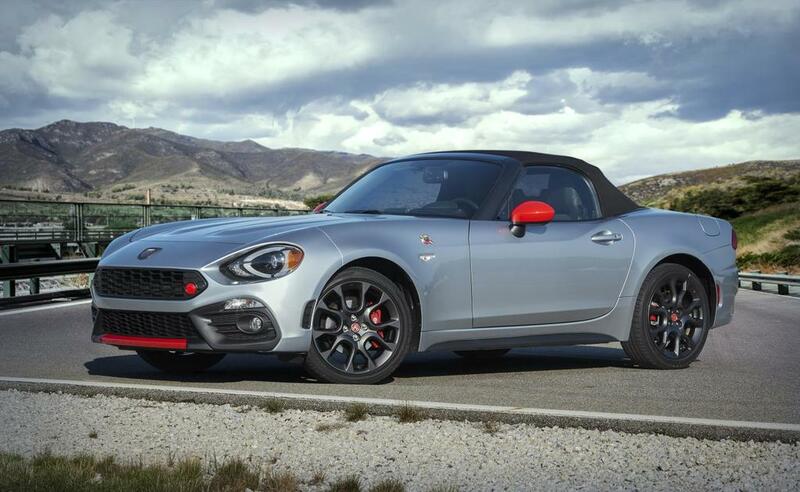 With the 2019 Fiat 124 Spider, the tweaks boil down to new sound, new stripes, and a new look overall. There is a newly available “Record Monza Exhaust” for the Abarth models. Fiat says it provides an “unmistakable Abarth growl” which is kind of ironic. Miatas, since the first ones, have had their exhaust note modeled after Alfa Romeos, known for their growly exhaust. Abarths? Not so much. They always sounded high-pitched and kind of tinny to me, but hey, here’s the bottom line on the Record Monza Exhaust: $995. My advice: Buy it! The Abarth Veleno Appearance Group goes for the boy-racer/I’m bad! look with red exterior mirror caps, lower fascia lip, and front tow hook. There’s also Abarth-branded carpeted floor mats (which look pretty cool) and a bright (but not polished or chromed) foot rest. All this for $495. Should you buy it? Can’t really advise you on this one slick, it’s more a matter of personal taste than anything, but it’s not a terrible move. The other bit of flash you can add is a custom, center-stripe design option. 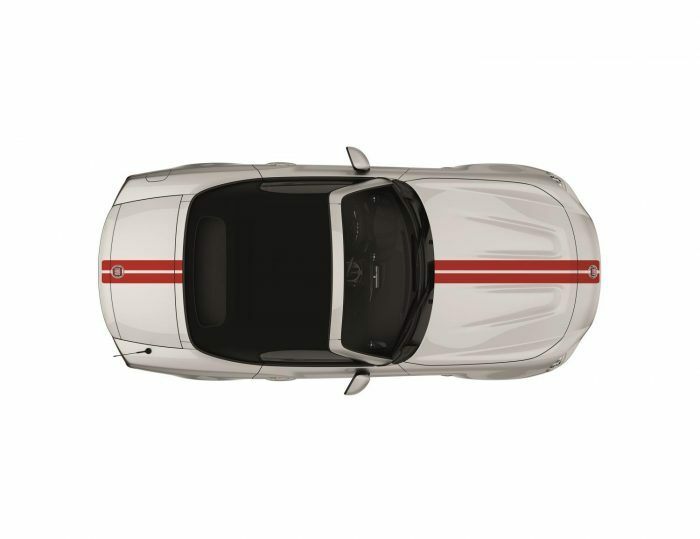 Available on the Spider Classica, the new “Double Rally Stripe” is available in either white or red. Also on offer is the multi-colored “Retro Stripe” in both white/gray and red/gray combinations. The stripes will run you $295. This is something I’d definitely get. I like old school racing stripes and more cars should have them. 2019 Fiat 124 Spider Abarth with Veleno Appearance Group and Record Monza Exhaust. Photo: FCA US LLC. So that’s around $1,500 worth of stuff, and most all of it sounds like money well spent, considering the already low starting price of a 2019 Fiat 124 Spider: $24,995. There are three models to choose from: Classica, Lusso, and Abarth. The Classica includes a dual-tip exhaust, black roll-bar finish and body-color header, side sills, and door handles. Standard are 16-inch alloy wheels, Nero premium cloth seats, halogen headlamps, and LED tail lamps. The interior is awash in soft-touch materials on the instrument panel and highlighted with silver accents. By comparison, the Lusso (which means “luxury” in Italian) gets 17-inch alloy wheels, silver-painted header and roll-bar cover, and dual-tip chrome exhaust. The leather seats are heated and come in either Nero or Saddle. There are Piano Black accents throughout. 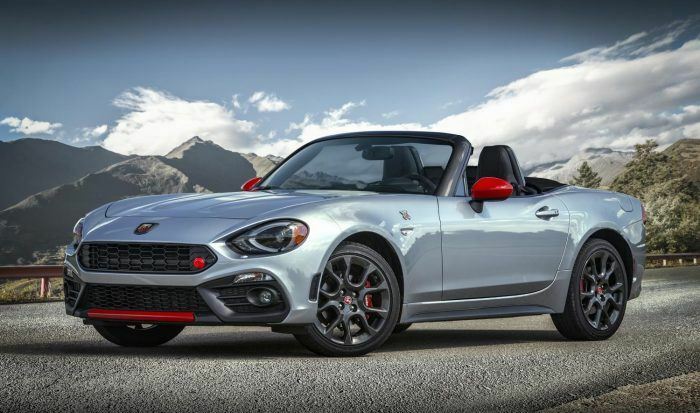 The 2019 Fiat 124 Spider Lusso starts at $27,795. And at the top of the heap is the Fiat 124 Spider Abarth, cranking out 164 horsepower through that turbo-four. The Abarth model is all about performance, with a front and rear Bilstein sport suspension, mechanical limited-slip diff, and front strut tower bar. Other available goodies include a Brembo braking system and Recaro seats. It goes without saying, but I’ll say it anyway: THIS IS THE MODEL TO GET. GET THE ABARTH. GET IT NOW. BUY IT BUY IT BUY IT! The Spider Abarth starts right around $30,000, and I think this is the model you should buy. I know I would . . . just need to talk with management here about a raise. 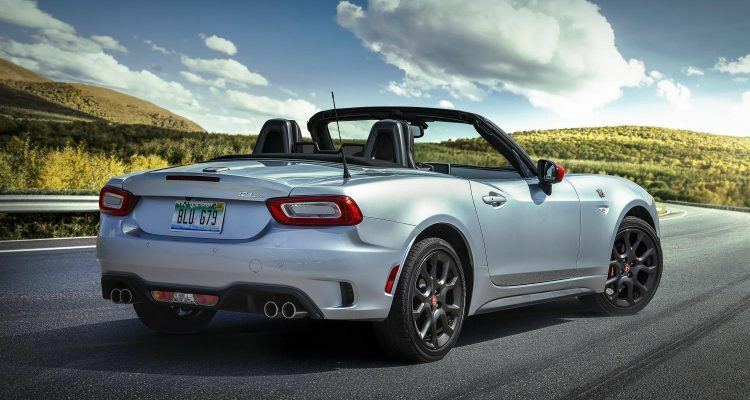 No Comments on "2019 Fiat 124 Spider: Growly Pipes & Rally Stripes"